"What are you doing for Lent?" This question was the topic of a Facebook discussion between students at the Boston University Catholic Center this past week. It is an important question. To ask this question--to prepare to live Lent--says that one is serious about his or her spiritual life. They are asking this question because they recognize in themselves a desire for conversion, a hunger to be renewed, and a thirst to be more perfectly conformed to Jesus Christ. There is something intensely personal about living the season of Lent, but there is also something refreshingly communal about it. Even its very first day--Ash Wednesday--provides us with a sense of both of these. Individually, we have ashes placed upon our foreheads and are reminded of our individual mortality and of our personal need for repentance. But, it is something that we do together. All around us are people who are engaged in the same spiritual battle. Last year, Lent changed for me. Perhaps for the first time in my life, I felt close to the Passion. Lent was marked not simply by the usual sacrifices. Instead, it was marked by the experience of betrayal, abandonment, and humiliation. It came like a bombardment of field artillery; relentless, unyielding, and disorienting. While I was informed that I was being transferred from a beloved assignment, that was not really the source of suffering. Leaving a parish that I loved was one of those difficult but expected parts of being a priest. In fact, that kind of suffering has somewhat of a sweetness to it. The sorrow that comes from leaving a good assignment is the result of the joy of having encountered Christ. So paradoxically, the greater the sorrow at a moment like that, the greater also is the joy. The Christian--and more intensely perhaps, the priest--is called to enter into the mysteries of Christ's Passion and Death. This experience is not only the physical sufferings that we endure, but also the experience of being handed over, betrayed, abandoned, calumniated, and humiliated. When Jesus says that we must take up our cross, it includes all of this. This is the Passion of Christ and this is where Lent leads us. Months before Lent, I had signed up and paid for a pilgrimage to the Holy Land. In the days after Easter, because I had already signed up, I went on the pilgrimage. The very last place I wanted to be was on that pilgrimage. The only thing worse than being on that pilgrimage was knowing that I paid to be on that pilgrimage! Each day, as we travelled from place to place together, I felt a more intense sorrow. In one of our last days on pilgrimage, we went to the home of Caiaphas and went down into the cistern where tradition holds that Christ was held captive before his crucifixion. It is customary to pray Psalm 88 in this place and to meditate upon Christ. As we stood in the cistern as one of our members read Psalm 88, I thought, "This is exactly how I feel!" What the pilgrimage lacked in pleasure, I suppose it made up for in reality. Last year, I lived Lent feeling close to Christ in his sufferings. But, simply to experience suffering is not what Christ asks of us. He invites us to experience the Cross with His Heart. To follow Christ is not merely the capacity to endure the Cross. To follow Christ is to conform our heart to His Heart. It is to look at those who harm us with the eyes of mercy. It is to forgive the one who injures us, to remain silent before the accuser, to place oneself into the hands of the betrayer, and to look tenderly on the one who abandoned us. Lent is given to us so that we experience the Passion and its graces from within and not merely from without. This year, I certainly hope that I will be spared a repeat of last Lent! But, it begins with a desire to live the Passion from within. It begins with a desire to live a closeness to Christ and to His Heart. 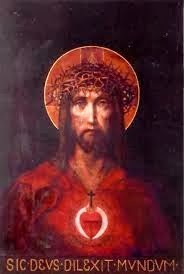 Whatever I'm doing for Lent, I'm doing so that at the end, I am better able to carry the Cross with a Heart like His. And, I take consolation that--like the people who stood by me last Lent--this year I am accompanied to the Cross with fellow pilgrims. I find strength and joy in knowing that these young pilgrims are approaching the battlefield with me and are readying themselves for battle. They are asking the question, "What are you doing for Lent?" Whatever we do, let's do it with the Heart of Christ.